Papers from this month's inspiration kit! ﻿﻿WOW! 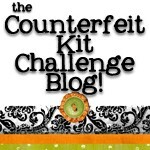 Can you believe we are already on our 4th month of Counterfeit Kits? Where has the year gone??? We have been having so much fun with this challenge blog, and are very excited to have a design team this month!!! Now for the reveal...the April 2011 Inspiration Kit for this is put together by a BRAND NEW kit club called Front Porch Kits...you can visit their website at http://www.frontporchkits.com/ . Front Porch Kits released their first ever kit club on March 18th...and it was sold out that very day, so this is an IDEAL kit to counterfeit!!! ﻿ Here is the link to a video of this month's kit... http://www.ustream.tv/recorded/13410163 . They show the contents of the kit starting at around 1 minute and 30 seconds, it lasts for a few minutes (although the video is an hour long, you do not need to watch the entire thing). There are not any add on kits this month, so if you need more supplies...you are going to have to use your own creativity!!! Try and match every piece in the kit as close as possible to something from your supply stash. Use the "kit contents" as inspiration, and recreate your own kit with the same types of supplies, but in a different color or style that corresponds better with your preferences/photographs/scrapbook style/tastes. Make an even smaller "page kit" or "card kit"..."counterfeiting" just a few items from this month's kit as inspiration. Using the color scheme from the kits as inspiration, try to re-create a kit of your own using whatever supplies you have available. Over the next week, we will add links to tutorials for counterfeiting many of the embellishments in this month's inspiration Kit's. 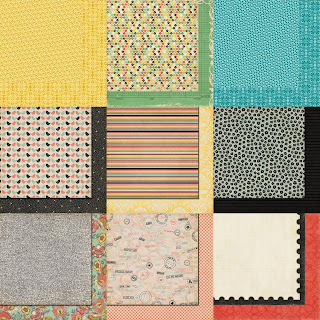 Over the next month, we will post mini challenges to USE your new kit, as well as organize a blog hop to share your creations! We are going to use a new Mister Linky each week throughout the entire month. To find the Mister Linky Post quickly, there is a link on the top right sidebar of our blog called "Mister Linky Post". Every time you would like to link a picture of your counterfeit kit, or a layout you made with your kit, please link it to that Mister Linky, also found here. You do not need to have a blog or on-line gallery to link your pictures. You can upload the picture to your Facebook (don't forget to share it as "public") and link that web address to Mister Linky! Or, if you need help figuring out how to link your work, please e-mail us, attach your picture, and we'll help you out. Our e-mail is counterfeitkitchallenge@yahoo.com. It is their March kit that we're using. Even though it's April for us. They release their kits on the 18th of the month. So their April kit won't release until April 18th...but we liked their March kit :) I'm going to try to fix the video link now. I was going to say the same as Scrappymo. I think the video works now...I don't know what was wrong before. Let me know if it's working for you now. Yahoo! What an awesome kit club we are doing this month!And a great idea to have a new Mr. Linky each week! How fun to see a new kit club coming on the scene after so many have closed their virtual doors. This kit is beautiful - I love the mix of colors and patterns, and oh, my, a great assortment of embellishments! Can't wait to get my version put together. That kit is gorgeous!! Can't wait to Counterfeit it. Stupid work getting in the way of my scrapbooking!!! Fun! I made a kit & posted a link in Mr. Linky! Awesome choice, I'll work on my kit soon! I just found this blog and I am so excited to get involved!!!!! Wow, this kit is going to be a easy for me. I own almost every patterned paper in this kit. Now just got to find some embellishment to go along with it. Thanks for letting use know about this new kit club and for making mr linky be weekly. Wow! This kit *will* be a challenge for me. Not my usual color schemes but I am looking forward to getting out of my comfort zone. Hope to get this put together this weekend!! Hello everyone! This is Lolly from Front Porch Kits and we just wanted to thank you for your sweet post on our first kit! We'll have our next kit reveal on April 12 and hope you'll stop by! Thanks again for the sweet comments and linky love! We'll be back to see what everyone created! Love the colours and patterns of this months kit. I am busy putting my kit together and looking forward to the tutorials ahead this month! I can't wait to see what everyone makes this month! Great Kit!